One thing I like about this hobby is the variety of perspectives—listeners demand genuinely different experiences from their hi-fi’s. Some want to feel like they’re listening to Bernstein conduct Mahler from the tenth row at the Royal Concertgebouw—minus the throat clearing and the hard chairs—while others want to be pressed against the stage at The Rafters in Manchester, watching Joy Division assault their instruments in a halo of pot smoke. Then there're listeners who want a seat behind a mixing console, hearing every syllable of Betty Carter’s voice electrifying the studio’s really silent silence. Me, I want the hi-fi to behave like the world's best jukebox—and, by extension, for my living room to feel like the world's most enjoyable dive bar. A hi-fi that cannot achieve what a good jukebox does—excitement, loudness, machine-gun timing, a feel-it-in-your-stomach beat, and enough jump to compel a room full of inebriated strangers to dance—isn't going to last in my New York City apartment. My long-suffering neighbors notwithstanding. This is probably an odd way to open a review of a DAC—digital reproduction tends to struggle with musical abandon. But the several months I’ve spent living with the DENAFRIPS Terminator have been nothing but consistent, feral fun. I discovered this minutes after the perspiring, swearing Fed Ex guy carried the Chinese DAC up the three flights of stairs to my apartment—the Terminator lives up to its name by weighing around 50 pounds and filling out a case that nearly overwhelmed my oversized Box Furniture rack. After my own grunting and swearing, I turned on Roon Radio while I tried to do some work… but as soon as I heard the opening track of De La Soul’s Buhloone Mindstate, work time was over. Even at low volume, every track sounded so approachable, so easy to listen to, that I simply let Roon Radio drive. The tracks, no matter how indifferently recorded—Run DMC’s “Peter Piper,” Coldcut’s remix of Eric B. and Rakim’s “Paid in Full” featuring the mind-stopping vocal by the Israeli singer Ofra Haza, even a live version of Biz Markie’s “Make the Music with Your Mouth, Biz”—were rendered with the musical excitement up front and intact, and zero confusion, hollowness or hardness getting in the way. Finally I sat down in front of the speakers to listen to “Sierra Leone” from Frank Ocean’s Channel Orange, a record I hadn’t spent much time with. Ocean’s voice hung above and between the speakers—huge, uncompressed, non-mechanical—and I sat there marvelling, wondering how I’d managed to miss out on this record. This was the first lesson the Terminator taught me—the extent to which my listening habits prioritized recordings that my hi-fi could make reliably lifelike, and excluded a whole swath of favorite music, leaving much hip-hop, eighties pop, hard rock, metal and early mono recordings unplayed. With the Terminator, I revelled in those records again: Whether it was Thriller, Reign in Blood, or Arthur Rubinstein’s Nocturnes — it was on. Over the weeks that followed, the Chinese DAC managed to sound not only tonally dense but also vividly detailed—qualities I’d considered incompatible. Of course both are the hallmarks of live music, and the Terminator managed to fill my living room with music that seemed more solid—less ghostlike—than any digital source I’d heard in my home. The sound image didn’t move or waver—musicians were there, planted decisively in space. And their spatial relationship was less ambiguous, too—on “Only the Lonely,” from the Capitol record Frank Sinatra Sings for Only the Lonely, Bill Miller’s borderline-schmaltzy piano playing sounded like it came from five feet to the left and fifteen feet behind the left speaker, an effect my hi-fi hadn’t managed before. Unlike certain components—which render recordings as though someone had turned their Photoshop contrast and sharpness controls all the way up—the Terminator achieved this level of realism without relying on hyped-up treble detail, but neither did it sound slow, gooey or dark. On the contrary, its sheer aural physicality ruled out tone-curve trickery—it allowed me to sit back and listen without having to work quite so hard to complete the process of reproduction in my mind, and this made my neck and shoulders unclench. That was the second lesson—real music relaxes you. Like many of the other DACs that have impressed me as making music as opposed to sonic holograms, the Terminator is a ladder DAC, utilizing a network of ultra-precise thin-film resistors to decode the digital data stream. With its dual FPGAs, the Terminator runs custom code, and much about its way with music remains proprietary. 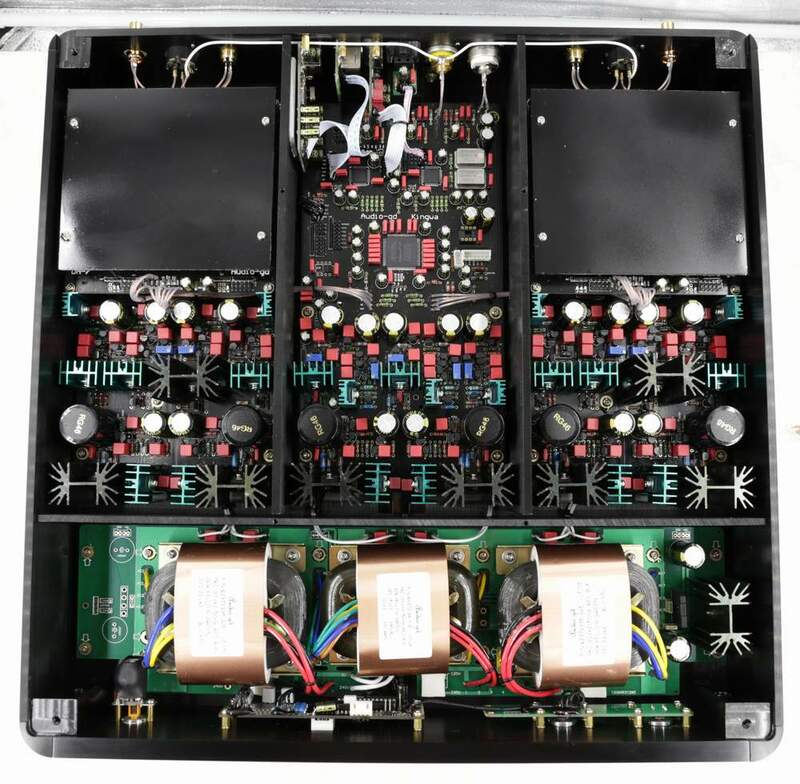 But we do know that the Terminator employs a particularly robust 300VA regulated multi-stage linear power supply that’s physically isolated from the signal circuitry, and top-notch components from Mundorf, CRYSTEK and Amanero, somewhat unusual in a component at this price ($4,260 USD). But, of course a bag of expensive parts isn’t enough for great sound—that requires taste, talent and vision. I’m convinced that Zhao’s nuanced take on music reproduction is the main reason for the Terminator’s insightful, unflappable sound, which in my experience hasn’t been achieved before at this price point. To reach this conclusion, I compared it to my beloved Holo Spring Level 2 ($1,800 USD). Compared to the Terminator, the Spring sounded vague, grayish, and slightly mushy. (In my system, the Spring prefers Roon to upsample files to double DSD, while the Terminator sounded better being fed native-resolution data.) Though it hurts me to admit it, the differences weren’t subtle. The altogether delightful BorderPatrol DAC SE ($1,850 USD), which I happened to have at home for review, didn’t fare much better—easy-going and beguiling in its musicality, it couldn’t match the Terminator in image solidity, tonal density or detail. Then again, given that these DACs cost less than half of the Teminator’s asking price, this wasn’t exactly shocking. After I’d lived with the Terminator for about a month, I got together with some friends at John DeVore’s Brooklyn speaker workshop and treehouse-for-adults – the Monkeyhaus. DeVore, Michael Lavorgna, Herb Reichert, Stephen Mejias and I decided to hear the Terminator in the company of the BorderPatrol DAC and two considerably more expensive units from totaldac. We chose four tracks and listened. Both the totaldac d1-seven ($20,480 USD) and totaldac d1-tube-mk2 ($10,680 USD) sounded best, while the Terminator and the BorderPatrol seemed to be tied—the Chinese DAC was better at unraveling Minoru Nojima’s Lizst and digging out detail, while the little tube-assisted BorderPatrol from Maryland made Amy Winehouse and Prince more enjoyable. There was no disagreement—we all heard it the same way (you can read Michael Lavorgna’s write-up of this shoot-out here. Yet the listening test seemed to contradict my experiences at home, where the Terminator bettered the Border Patrol in every meaningful way—and sounded much better than it had at the Haus. What else can I tell you about the Terminator? It offers the option of allowing oversampling to be turned on and off—to my surprise, I preferred it engaged. And I enjoyed the DAC most fed through its I2S input, with the help of the useful and very-nice-sounding KitsuneTuned edition of the Singxer SU-1 digital-to-digital converter. These details aside, my time with the Terminator proved to be both transformative, edifying and wicked-fun. It’s the best-sounding digital source—by a considerable margin—that I’ve heard in my home, and it reunited me with more of my music than any other. It represents excellent value—while it isn’t cheap, buying it requires neither a law degree nor an inheritance. And while the Terminator seems to engender hype on the Internet, I must concede that much of that hype is deserved. To turn an old saying on its head, this thing’s all steak and no sizzle. Great review, to the point I felt well informed about what the sound of this unit is like! Also, great context within one's life and love of the hobby. Can you explain a little on this statement. "Over the weeks that followed, the Chinese DAC managed to sound not only tonally dense but also vividly detailed—qualities I’d considered incompatible." Dense, detailed and incompatible leaves me feeling negative about this product. How detailed is it, glaring harsh etc..
Over the weeks, how many weeks before you sent it back ? The point I was trying to make is that many DACs either prioritize detail at the expense of tone, or tone at the expense of detail. This DAC, on the other hand, had both extraordinary tone and loads of fine detail. Hope this makes it clearer. When I look at the rows of resistors, it makes me wonder about reliability compared to on-chip DACs. Your attention to detail (a' la Computer Audiophile) no doubt allowed the Terminator to put its best foot forward and demonstrates that a "review" is NOT throwing a component into any given system and making a judgement on how it then performs. Very interesting review. Well written and enjoyable to read. I'd love to read more from Mr. Halberstadt. I would like to know more about his system, which helps put the review in context. I also would have liked to see more in this review about the technology in the DAC, particularly the gazillion small capacitors, which is very unique. But I understand that reviews don't always need to repeat technical explanations that can be found on the manufacturer's website. Cheers! DeVore source was not as good as the one you have at home and a better revealing DAC will show you that. Plus if you have more than 1 pair of speaker in the room it's harder to judge with accuracy people tend to judge the wrong things.were they more than one pair of speakers in the room ! There was more than one pair of speakers in John's studio—he's a speaker manufacturer, after all—but we listened to only one pair. ok, but the ones that are not playing influence the sound that you earing negatively.at home i suppose you had only 1 par of speaker..